Erlick (GermLine) knows his medicine, as shown in the compelling descriptions of the virus's effects and how easily it spreads from one person to another...made all the more chilling given today's too real fear of bioterrorism. Fans will enjoy Nelson Erlick's fine medical thriller. Light the lamp, bundle up, and prepare for a great night of reading. 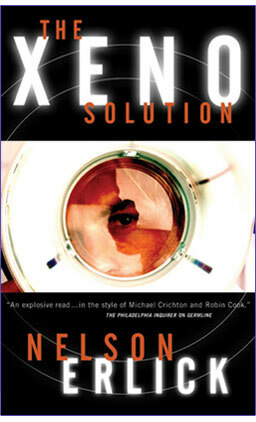 The Xeno Solution is a fascinating, non-stop read, imaginative and terrifying. The Xeno Solution is taut, superbly written and utterly plausible. Nelson Erlick has followed up his hit GermLine with a tale of twisted science and frightening consequences. I couldn't put it down. Nelson Erlick knows his medicine and knows how to write with unremitting tension. It doesn't get much better than this. Nelson Erlick has taken his place among the very best writers of medical suspense on the scene today. ---Michael Palmer, author of The Society, Miracle Cure, Critical Judgment, Silent Treatment, Natural Causes, Extreme Measures, Flashback, Side Effects, and The Sisterhood . An international bestselling author, his books have been translated into 30 languages. Bristling with authority, Nelson Erlick's The Xeno Solution provides just what the doctors order in a medical thriller and then some: a tight, original plot, terrific pacing, and a fear quotient that's off the charts. ---John Lescroart, author of The Motive, The Second Chair, The First Law, and Dead Irish . A New York Times bestselling author , his books have been translated into 16 languages. A provocative, intelligent, thriller based on cutting edge science that strikes terrifyingly close to home. ---David Dun, national bestselling author of Necessary Evil. The Xeno Solution is scary and believable. A timely, fast moving story about the intersection of business of medicine. I completely enjoyed this thought provoking treatment of organ transplant technology and its future ethical and practical dilemmas. ---Donald A. Davidoff, PhD (half of the writing time G.H. Ephron), author of Obsessed, Delusion, Addiction, Amnesia, and newly released Guilt. The Xeno Solution gives the reader a harrowing look at the world of biotechnology and the all-too-real dangers associated with the rapidly advancing field of xenotransplantation. Erlick is not only a terrific writer, but as an insider, he absolutely nails his portrait of the industry. The Xeno Solution is a nail biter, filled with up-to-date technology, terrifically complex characters and a storyline that makes the book absolutely impossible to put down. Don't miss this book--it's one of the best medical thrillers to come along in a very long time. ---April Christofferson, author of Buffalo Medicine, Patent to Kill, Clinical Trial, The Protocol, and Edgewater. Nelson Erlick has created an exciting new type of medical thriller--one that casts an expert eye on cutting-edge medical science and asks, "What if?" ---Dirk Wyle, author of the Ben Candidi Mystery Series including Bahamas West End is Murder, Medical School is Murder, Biotechnology is Murder, and Pharmacology is Murder.